Desert Rose 2019 retreat will be taking place at the magical luxury resort of Dar Sabra. 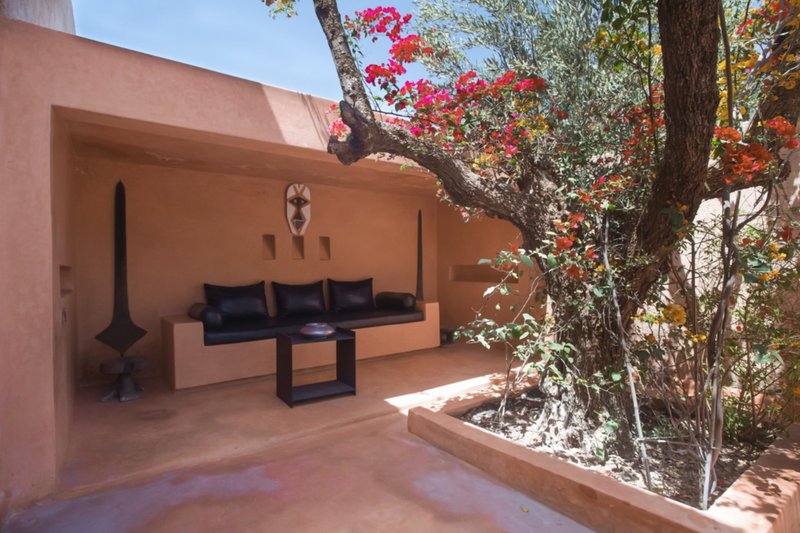 Situated in the Marrakech Palmeraie, 10 minutes away from the tumult of the medina (city), Dar Sabra is the ideal place for those seeking peace and quiet, just a few minutes from the centre of Marrakech. The gardens of the hotel, spread over 2 hectares, offer a showcase for over 60 works of art created by world-famous artists carefully selected by the hotel owner. 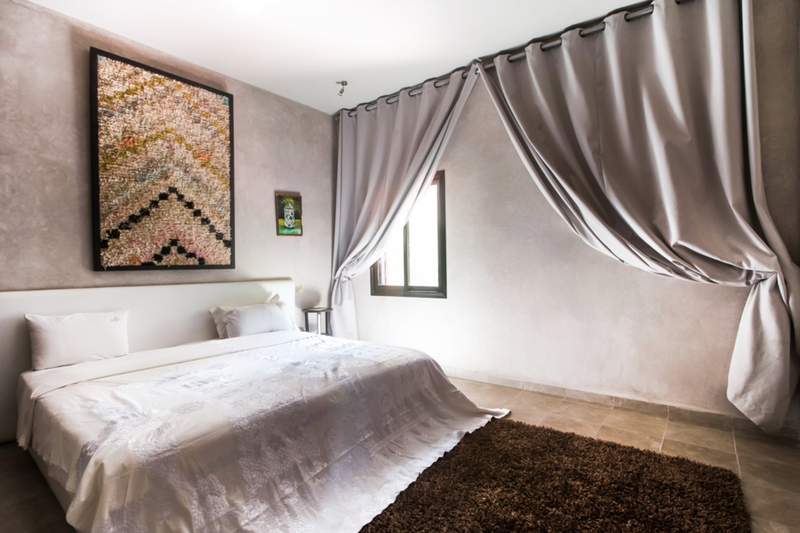 Dar Sabra Hotel Marrakech offers its guests a cultured parentheses during their stay, where beauty is combined with well-being in a voluntarily uncluttered universe. The tone is set, at the Dar Sabra Hotel Marrakech, art does not impose, it speaks!!! To book one of the rooms for Desert Rose retreat 2019, click here. The Dar Sabra hotel has 22 lodgings, going from luxury rooms of 35 square meters and private terrace to the separate villa of over 110 square meters with private pool and garden. Taste the benefits of relaxation at the spa thanks to the manual therapies: hammam, exfoliation, relaxing massage, Moroccan tonic massage, ... or simply by strolling around our three sublime outdoor pools. Also, the high-tech gym and the clay tennis court will help you maintain your tone. 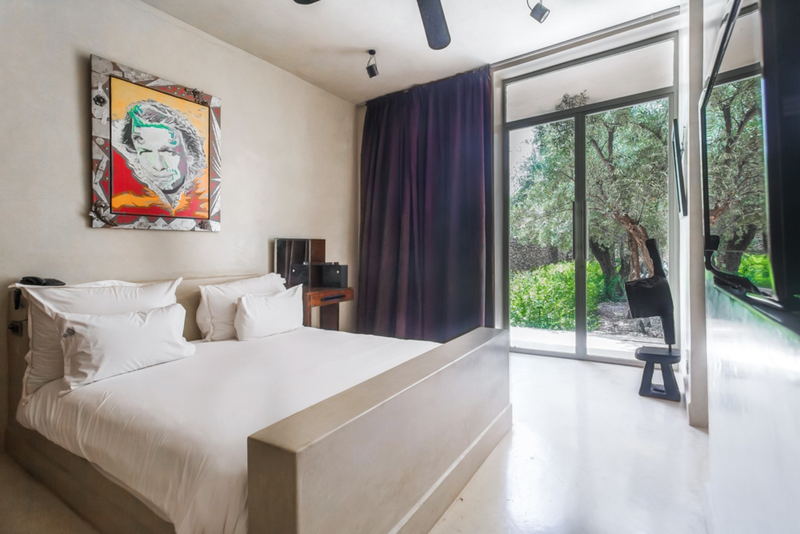 Eight 90 sqm Superior Suites with graphic and contemporary atmospheres are situated facing a pleasant private patio with a hundred-year-old olive tree. The large bay windows flood with light the spacious rooms equipped with a king-size bed and a large bathtub. Separated by a long swimming pool, each suite has a private beach and is built in the lower ground floor in order to ensure an ideal temperature in summer as well as in winter. Email events@ladydork.com for double occupancy options. Amenities: air conditioning, sound proof rooms, safety deposit box, non-smoking rooms, private terrace, free Wi-Fi, flat screen TV, hair dryer, bathtub with separate shower. The Villa di Rosa represents absolute luxury with its surface area of 110 square meters and its private swimming pool. This luxurious pavilion with its modern, polished decor consists of a large living room and two rooms connected by a splendid bathroom with separate shower and bathtub. The inner living room with a fireplace and a desk is complete enclosed in glass with a view of the private swimming pool, and the garden is arranged for private meals, served at the table of contemporary sculptor Michel Guino. In the evening, it is possible to organise candle-lit dinners. Set apart from the public areas of the hotel and with a private swimming pool, the Villa Blanche has 2 rooms. A large, modern, 90-square meter suite is equipped with a king-sized bed, a bathroom, a desk and a sofa corner that allows for a third bed (at additional charge). A second, more intimate room offers 2 twin beds (can be converted into a large double bed) and is equipped with its own bathroom. The villa has a flower terrace at the entrance of the rooms and a private swimming pool behind the Superior Contemporary suite. Amenities: Air conditioning, sound proof rooms, safety deposit box, non-smoking rooms, private swimming pool, private terrace, free Wi-Fi, flat screen TV, hair dryer, large bathtub. 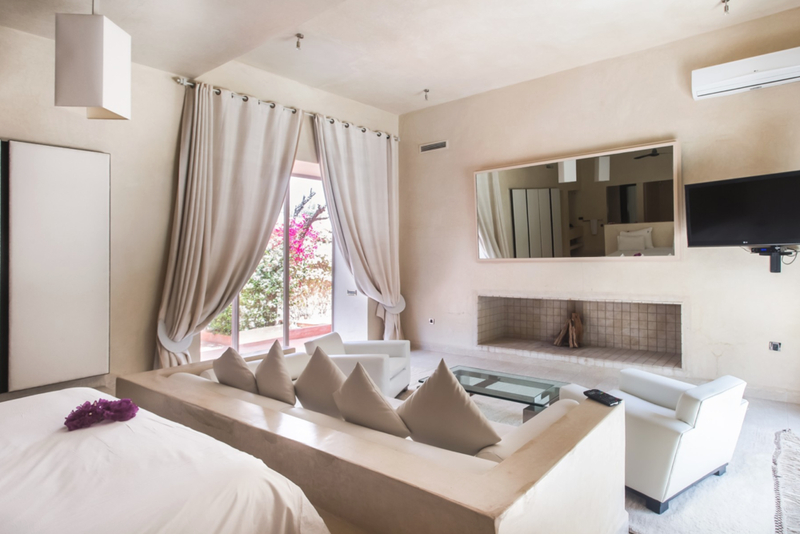 Slightly secluded from the public parts of the hotel, the 90sqm Superior Quadruple Suite has 2 connected rooms, 2 terraces and a bathroom. The first room has a double bed and the second room 2 twin beds (can be converted to a large double bed). The two large terraces adjoining the Suite offer 2 different atmospheres: one flowery and the other landscaped with bamboos. They are arranged with an outer living room where it is lovely to relax in privacy. 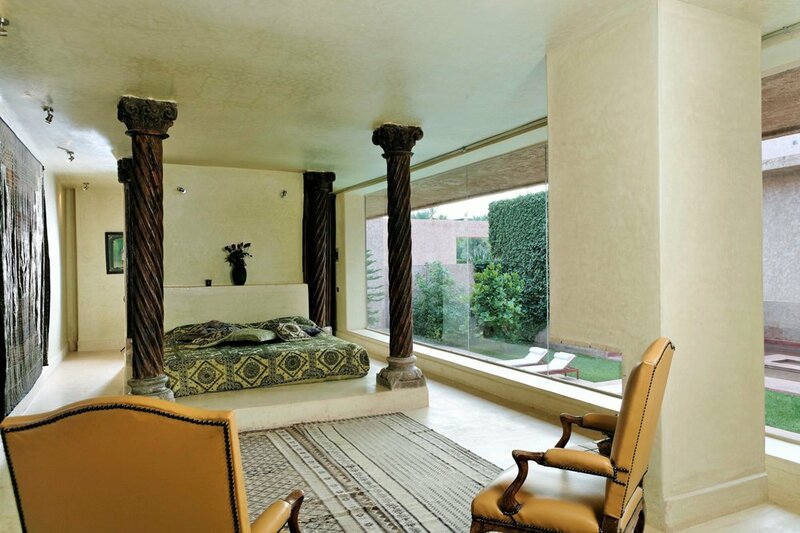 Indian (Sold out) & Afghan (Sold Out): The lovers' favorites with their large bay windows facing the cozy pool of the junior suites and a balcony facing the surprising agave garden. These suites are situated on the ground floor. Zen Suite (Sold out): Comfortable, simple, elegant and romantic, this suite is completely white. The Zen suite has direct access to the junior suites pool and to the reception area. It offers a very modern bathroom with a spacious, open shower. Amenities: air conditioning, sound proof rooms, safety deposit box, non-smoking rooms, private terrace, free Wi-Fi, flat screen TV, hair dryer, large bathtub (except zen).